Standout Tidbit: Obligatory mural of Manhattan skyline with very creepy, giant-sized, ghost twin towers of the World Trade Center super-imposed over the cityscape. The Statue of Liberty holds an Anthony’s pizza box. Review: I find it quite appropriate that the first entry into the Zealots of Za blog is about a pizzeria that is first in the hearts of many a core Zealot. Although the first Anthony’s opened in downtown Denver back in 1984, we did not discover it till the fall of 1995 when several of us were working together nearby. 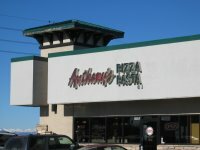 When taking a new job south of Denver near the Tech Center back in 2002, I was overjoyed to learn there was an Anthony’s not too far away. Soon I had a regular group making weekly pilgrimages. 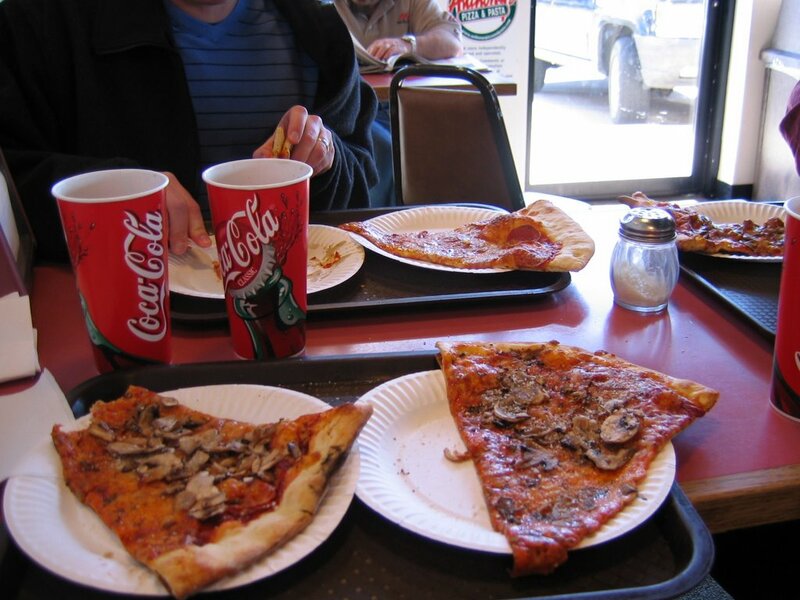 Now, about the pizza… Anthony’s bills themselves as serving New York style pizza. Based on my very limited exposure to real NY pizza in the Big Apple, I think they do a pretty good job even though they aren’t using a coal or wood-fired oven (what many would consider a crucial element for true NY-style). Anthony’s dough is tossed high and laid out very thin. When cooked, the crust is slightly crispy on the bottom while still a bit chewy inside. The slices are large and best eaten folded to counter occasional floppiness. The application of toppings is usually generous without burying the pie. The sauce is slightly textured and flavorful with spices, but not to the point that it stands out above the other layers. The cheese is very tasty, and we have been told that it is the high butterfat content that causes the random pools of orange fluid on top of the slices. 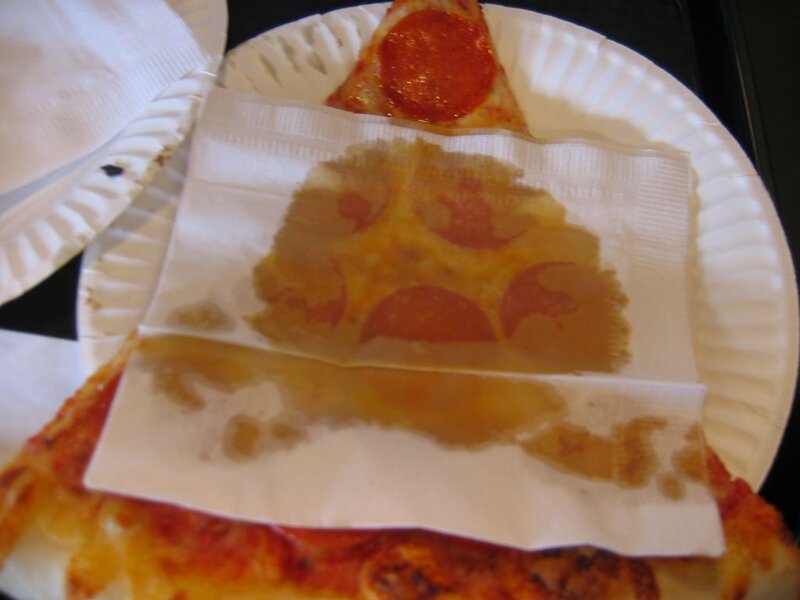 Fellow Zealot, Robin, calls it grease and tries to pat it away with a napkin, while I simply call it “dippin’ sauce”. The toppings are generally fresh, with the use of non-canned mushrooms being a good indicator. 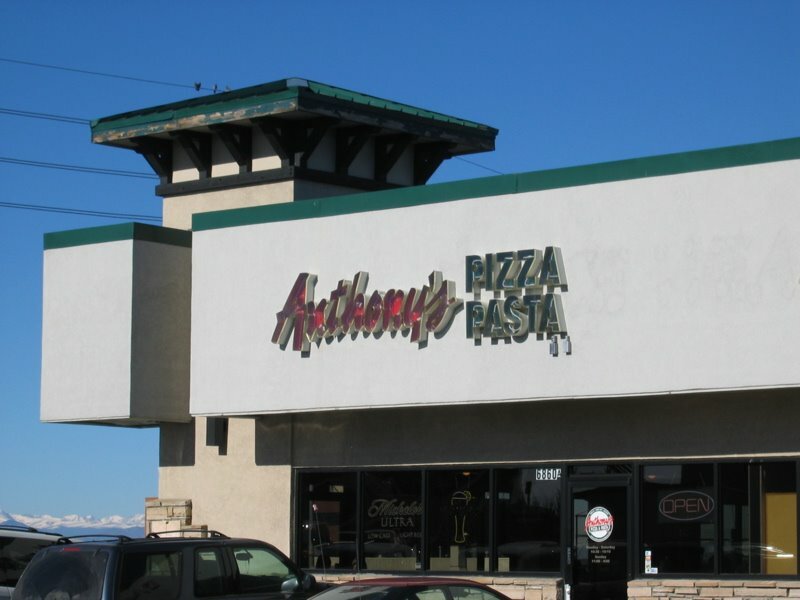 I should also state here that Anthony’s also offers a Sicilian pizza (thick crust) and pasta, however, in my ten years of frequenting various Denver metro locations I have never sampled anything beyond the signature thin crust pizza. The staff during the day at the DTC location is young and friendly, even during the stressful lunch crowd when the line can reach the door. During these busy times there may be the odd missed order, or a sub-par slice (re-heated too much, or not up to proper “big-as-a-plate” size), but if you mention your dissatisfaction, I have found they are more than willing to rectify the matter. This is NOT the case at all Anthony’s locations, as I have heard from other Zealots who will hopefully post their findings here as well. Based on the occasional inconsistency with slices, I have recently (the past 9 months) taken to ordering a whole pie whenever visiting the DTC location for lunch. This way, my slices are always fresh and I get the pick of the pie for size. The only requirement for me to do this is that I have at least one other person eating with me who is willing to go in on a non-meat pizza. I usually say the leftovers are going home to Robin, even though I conveniently “forget” that she isn’t a big fan of the shrooms. As far as the setting, this location is almost 2 years old (they moved from another spot in the shopping center) and it is kept rather clean. There is quite a bit of seating with about 10 booths and again as many small tables. During the warm times, there is also seating on a patio outside. To sum up… far more often than not, the DTC Anthony’s serves up great slices and outstanding whole pies. I’d rather be downtown at location #1, but this is a fantastic alternative in the meantime.